Small drop zone, personal touch. Being smaller results in a more relaxed and personal training environment. You’ll know your instructor when you walk through the door, and they’ll know you! We may be a smaller drop zone, but our landing area sure isn’t! With over 100 acres of wide open space, our landing area is one of the biggest in Texas. Also, our location and the smaller aircraft we fly result in far less dangerous air traffic to deal with while you’re learning. We utilize a program developed by the United States Parachute Association called AFF, or “Accelerated Free-fall.” Your AFF Course will consist of an initial 7 levels with instructors, which can be completed in as few as 7 jumps. Upon completion, you’ll graduate to “self-supervised” status, meaning you can jump without an instructor! 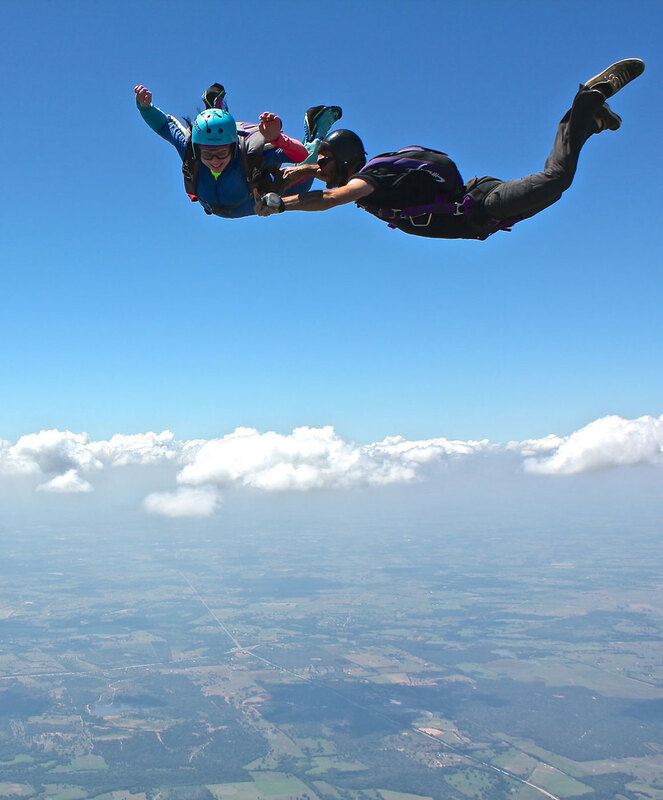 While logging jumps toward the minimum 25 required for your license, you’ll fly another 6 skydives with a coach who will teach group jump safety skills. You’ll also learn how to pack your own parachute. We have the flexibility to work with you at a pace you’re comfortable with, every step of the way. You can get a head start by downloading the Skydiver’s Information Manual (SIM) from USPA’s website. It’s FREE! At least one tandem skydive. We take reservations for AFF by phone only, so give us a call when you’re ready to start this awesome journey! As long as the weather allows, we’re ready to fly, so be spontaneous and reserve your jump today!